It leaves no one alive ... the ManBearPig is a monster from the adult cartoon South Park, warned about by a fictionalized version of Al Gore. It's become a pop-culture symbol of hoaxes or ridiculous beliefs. Sure, you get the occasional clunker (are we the only ones who hated that Al Gore manbearpig episode? ), but the overall quality continues to be astounding. I haven't seen the manbearpig episode since it came out, but I don't recall feeling like it was a denial of climate change. Al Gore is just inherently fun to mock because of his weird combination of passion and dryness. / And manbearpig turns out to be real, anyway. Where does ManBearPig come from? Following his unsuccessful bid for the US presidency in 2000, Bill Clinton’s Vice President Al Gore moved away from electoral politics and instead devoted his time to warning the population about the very real threat of environmental catastrophe due to climate change. The satirical cartoon South Park makes a point of poking fun at topical, hot-button events and issues, and so Gore became one of the show’s targets. In the 2006 episode “ManBearPig,” an animated depiction of Al Gore comes to South Park Elementary to warn the students of an existential threat menacing mankind: not global warming, but a part-human, part-bear, part-hog beast that he calls, naturally, ManBearPig. When no one believes Gore, he responds that he is “super-duper cereal”—or “super-duper serious,” a joke alluding to an apparent cereal/serial pun Gore once made. During the course of the episode, ManBearPig is revealed to be a hoax created by Gore for the purpose of making himself out to be a hero. However, a horrifying version of ManBearPig appears in a later episode of the show as an imaginary creature in place called Imaginationland … of course. Though neither version of ManBearPig ever became a regular character on the show, the monster did become a meme. Since 2007, the website www.ManBearPig.net tracks “sightings” of the beast. In 2008, the biotechnology website Think Gene did an April Fool’s prank claiming that a real human-bear-pig chimera had been developed. In 2010, a New York Times piece mentioned that there was a military outpost in Afghanistan named after the monster. Since its South Park debut, ManBearPig continued to follow Gore, though he never actually believed in the creature, which is definitely not real … as far as anyone knows. South Park‘s politics are often tricky to decipher, but the ManBearPig, with Al Gore warning of a fictitious threat to mankind, was arguably less a mockery of climate change (which is real), but rather, a mockery of Gore. 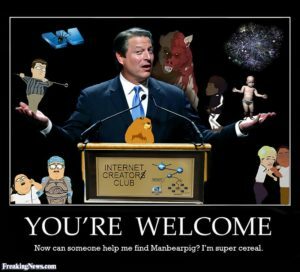 Climate-change deniers have occasionally used ManBearPig as a symbol of their denial, but plenty of climate-change believers quote the episode as well, viewing it as a spoof of hypocrisy. These days, references to ManBearPig are usually used for inside jokes about either South Park or insults to Al Gore. When the monster comes up in political memes, it can be easily turned against either leftwing or rightwing individuals: The key of ManBearPig isn’t really Al Gore, but rather, the idea of believing in something inherently ridiculous. ManBearPig’s name and image are sometimes used to represent how easily people can get swept away by existential fears, whether those fears are real or not, through fake news and propaganda. Shoutouts to the guys handing out #Manbearpig awareness posters downtown today. Started my day off with a laugh, ya'll.